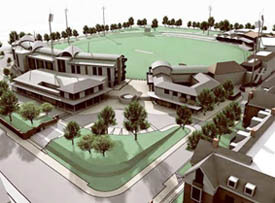 Kent County Cricket Club found itself in the enviable position of being able to offer a location for housing development adjacent to Canterbury City centre, enabling an extensive redevelopment of its St. Lawrence ground facilities. To provide detailed topographical survey of the whole site for potential housing development and upgrading of ground facilities. 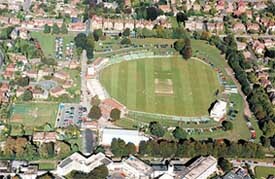 Prior to submitting a quotation the survey brief was discussed with the Architect. A detailed quotation was supplied and on instruction further discussions were held to clarify specification and confirm any amendments. GPS SmartNet was used to establish Ordnance Survey National Grid and level datum, with a check to a local benchmark. A control network was established using closed loop traversing and all detail was surveyed using Leica 700 series TCR instruments. As part of the investigation into the potential use of the site for housing the surrounding roads were required in detail. All road detail was surveyed with Leica 700 series TCR, with reflectorless mode used to obtain levels and details with the live carriageway, thereby eliminating the need for traffic control with associated costs and potential time delay. The survey was processed using N4ce survey software with all GPS and TCR control checks verified prior to detailed processing. In addition as part of our Quality Control system a contour model was generated with contours at 0.05m interval to identify potential target height errors. On completion of N4ce processing the project was exported to AutoCAD for drawing preparation and then initial checking by a Senior Surveyor prior to a site visit for field verification. On completion of the final drawing using AutoCAD a rigorous final check covering all aspects of the survey with particular emphasis on cartographical standard was completed by a Senior Surveyor, following which the survey was issued to the Architect as a 2D AutoCAD file and paper plans.